Richmond is known for its hot and humid summers. 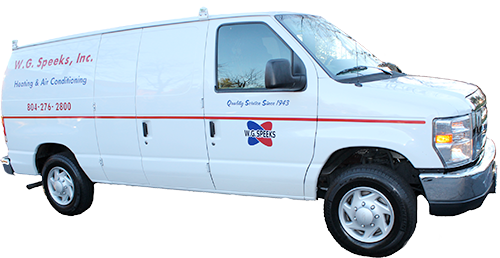 WG Speeks can help to keep your home cool and comfortable all season long by servicing, repairing, or replacing your air conditioning. Air conditioning is a necessity in Richmond, especially during the hot, humid summer months. Locals will agree that there’s no misery quite like having an air conditioning not working in the middle of a heat wave. It’s important to invest in a quality air conditioning system as well as ongoing maintenance from a company you can trust. As a trusted leader in the industry, you can depend on W.G. Speeks for great service whenever you need us. Trained professionals can keep your air conditioning unit running smoothly by providing timely, seasonally-appropriate care. Committing to a proactive maintenance schedule can keep you cool and comfortable while saving you money. Your air conditioning unit has stopped cooling or is cooling unevenly. Your air conditioning unit is making strange noises. Your air conditioning unit seems to be working harder. Your energy costs have gone up. W.G. Speeks has been providing air conditioning repair, installation, maintenance and replacement services since 1943. Our commitment to excellent customer service and craftsmanship has been part of the Greater Richmond area for more than 75 years. Contact our certified technicians and sales staff today. We can help you come up with a strategy that works best for your needs and your budget. Best of all, we offer a free consultation and estimate!